Label Analytics has developed a framework entitled “B.E.S.T. Practices for Label Development” to create a sustainable package design process. It is deliberately calculated to answer the important questions at each stage of development of your label, offering four logical steps: Benchmark, Explore, Substantiate, and Talk It Up. 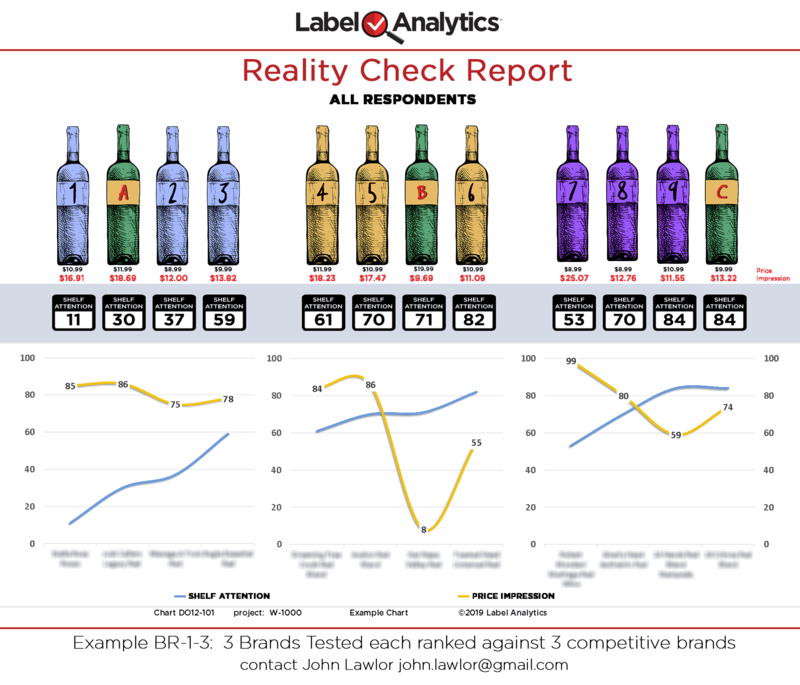 Taking the guesswork out of what attracts shoppers, with our patented research approach, Label Analytics offers you insights from testing over 600 wine packages. The first step in our process is Benchmark. Benchmarking is a critically important marker for your decision-making process. Whether you are starting a new brand or revitalizing an existing label, you’ll need to know who your competitors are and how well your package performs, both for shelf attention and price impression. In the following scenarios, we offer two benchmarking options, which we call the Label Analytics Reality Check and the Label Analytics Opportunity Map. Let’s use the following scenarios to illustrate how they can help you. Scenario #1: Your distributor or retailer thinks your brand is not standing out on the shelf and suggests you should redesign the package. Our Reality Check Report tests your current packaging. Using a national survey of 500 wine shoppers, we measure your current shelf attention and price impression compared to your three top competitors. Based on this quick, low priced test you get an answer from real wine shoppers. If it turns out your package could benefit from a redesign, then you can take appropriate action. If our testing finds your package does a good job of standing out on the shelf, then you have that insight. Either way, you can share the shopper findings with your team, your distributor, your retailer to demonstrate that you responded decisively to their concern. Scenario #2: You’d like to introduce a new wine that expands into a new competitive arena for your brand. How will your brand compete, what style of package works best in this new set of competitors? Our Opportunity Map Report provides a broad view of a competitive arena. It measures how well your brand package stands out on the shelf [shelf attention] and how its price impression stacks up to specific competitors. Further, since you will see the package performance of 20, 30, or 40 competitors, you can see what style of package and package graphics work best with shoppers in this new arena. For example, “If your new wine is a Riesling, should you package it in a blue bottle?” This is foundational information for expanding your brand into a new varietal or style of product. Benchmarking is important. Whether you are responding to a concern about the performance of your package, like Scenario #1, or you are introducing a new product or package like Scenario #2, getting shopper- based answers for your package performance questions and discovering how your package stacks up to competitors is fundamental. Those insights can guide your packaging decisions and save money by helping you direct the process toward the right goal. By using one of our Benchmark services, you can ascertain whether your current label is on the right competitive track or not. In the next B.E.S.T Practices article we will cover the Explore step and how to maximize your designer’s output for greater marketplace success with your label.